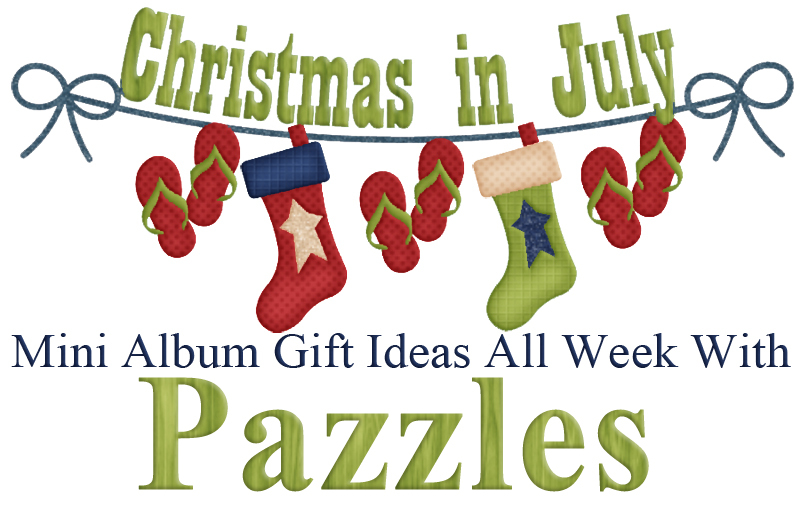 It’s Christmas in July over at the Pazzles craft room. this week. 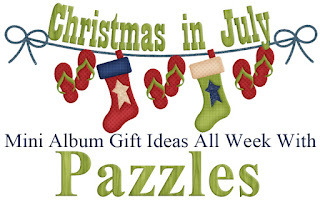 That means all week long designers will be sharing some great mini albums that you can craft now for those on your gift giving list. I chose to go with a Calendar theme. This makes the perfect gift for special friends and or family. I started with the Scalloped Shaped Frame. I sized it to approximately 8.25 x 8.25. I cut the scallop in white. I cut out seven of them. I then cut the larger mat out in kraft cardstock. I cut out 14 of and adhered them to both sides of the white scallop mats. I then chose several patterned papers from the DCWV Linen Closet. I love the beautiful soft teals, blues and greens. On some of the months I added a few extra decorative die cuts. I created the little mini calendars and the labels for the months. I printed them out and cut them with my Inspiration Vue. For the month labels I used the title frame 1. I cut them out in white and kraft paper. I added in the notes card I made so that I could write down the special dates for each month. 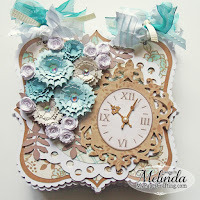 For the cover I used the Fancy Frame Clock and created a clock face. 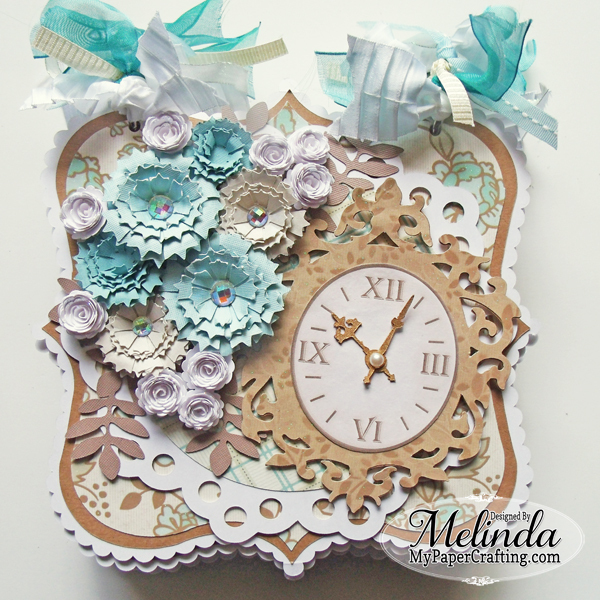 I also used the vintage clock hands for the hands of the clock. I then created some flowers and used the Twirled flowers and the flower burst files for the flowers. For the leaves I used the flower basket leaves. I chose to create my album with holes in the top as it will be hanging from the that position. I inserted rings and added some ribbon to the rings. This makes the perfect gift for friends and family. Be sure to head over to the Pazzles craft room for the free printable downloads! Be sure to head over to the Pazzles Craft Room and grab the freebies I made for craft room members. I made the printable pdf’s of the calendars, labels, clock face and notes. Beautiful!!!! You did an amazing job with this calendar album!! Wow Melinda, this calendar is so Beautiful!! !